You must be thinking to yourself I am so sick and tired of all the cold weather, I am ready to go on vacation and enjoy the emerald waters, sugar white sands and the hot weather that Panama City Beach has to offer. I have my room and the dates, we are all set. WAIT! I do not know what to actually do when we are there. Do not worry we have lived here for quite a while and know all the best activities for your family to do together. 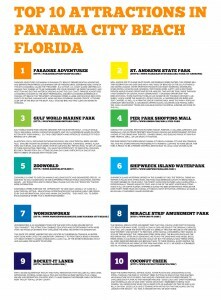 We have made a “Top 10 Activites to do while in Panama City Beach” list of our personal favorites. We made sure our list has a variety so it is appealing to the entire family and just in case it decides to rain one of the days you are on vacation. We have everything from dolphin sightseeing to Ripley’s Believe It Or Not. With so little time on your vacation we want to ensure you take full advantage of what Panama City Beach has to offer when it comes to entertainment. We hope that our list will help you to plan out your perfect vacation and that our recommendations keep you coming back to us for more information about Panama City Beach and what it has to offer. © 2019 Paradise Adventures. Curiosity Marketing Group.